Key genetic changes allowed certain canines to eat starchy scraps left by humans, study shows. The question of how some wolves evolved into the trusty dogs that work on farms, lead the blind and curl up on pillows in bedrooms has remained largely unanswered. Until now. An international team of researchers used complex genetic analysis and an understanding of archeology, ecology, biochemistry and agricultural science to discover that adaptations that allowed dogs to thrive on starch-rich diets was central to the domestication of canines. "I think the domestication of dogs is especially interesting because we have such a special relationship with dogs; they stand out in terms of being domesticated animals, as they become part of our families," explained study author Erik Axelsson, an assistant professor at Uppsala University, in Sweden. The transition from wolf to dog was relatively simple. 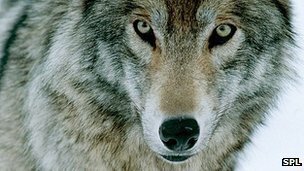 In early agricultural settlements, "humans began to gather their trash into small waste dumps, which might have attracted wolves because the waste dumps provided a relatively constant supply of food," Axelsson explained. "That sort of nutrition must have been the leftover remains—of what they ate, which included starch." To be an efficient scavenger, a wolf had to have an effective method of digesting starch, he said. "Some wolves were slightly better than others at digesting starch and had an advantage. A natural selection process created animals that we later called dogs." Axelsson said it's actually easy to envision how it might have happened. To be able to effectively grab food out of the waste dump, dogs had to be comfortable around people. "Imagine a shy wolf running away every time it saw a human," he noted. As for when the evolution of wolves into dogs may have occurred, Axelsson said it's hard to give a well-defined time. He said both archeological and genetic data suggests it could have happened anywhere from 6,000 to 30,000 years ago. While the evidence isn't conclusive, Axelsson noted that the genetic data combined with the researchers' collective understanding of archeology and other fields fits their conclusion: dogs' increased ability to thrive on starchy food, as opposed to the meat-rich diets of wolves, represents an important step in domestication. The research was published in the Jan. 23 issue of the journal Nature. To understand the genetic changes associated with the transition from wolves to dogs, the researchers compared whole-genome sequences of domesticated dogs with those of wolves. Genomes are a full set of chromosomes representing all the inheritable traits of a single organism. From 3.8 million genetic variants, the researchers identified 36 targeted genetic regions that likely played a role in the domestication of dogs. Eight of these regions had genes related to nervous system pathways and 10 had genes involved in starch digestion. Axelsson explained how the researchers know when they've identified something critical through the genetic analysis: "When a mutation occurs, it will arise in one individual and if the mutation confers a good trait—in this case being able to digest starch—then in a relatively short time period, everyone will carry that mutation. Usually there are lots of other mutations, too, but nearby that mutation for the good trait, there won't be any other mutations or genetic variations in that region." So, "When all dogs look similar on the genetic level, then you have a signal, or a sign, that selection is happening," Axelsson said. The researchers said that the study results show how coping with an increasingly starch-rich diet when humans began to grow their own food caused similar adaptive responses in dog and human. While this may all sound quite academic, Dr. Amber Andersen, a veterinarian at Point Vicente Animal Hospital in Palos Verdes, Calif., said the research provides practical guidance about what your beloved dog should be eating. "There has always been this argument that dogs are meant to eat meat, but now I can feel even more confident telling my clients that dogs have adapted to eat starches and can eat them in kibble, for example, unless there's a specific allergy or a chronic medical condition where we're concerned about starch digestion," Andersen said. Andersen added that the study also points to the importance of understanding that people and their dogs and other pets inhabit a common environment, including the home, the backyard and the community. "Since the very beginning, there's been this shared environment," Anderson noted.